Emerging from the fog at Penn National, stakes placed BANTY’S GIRL (Shackleford) easily won in allowance company. Last year she placed third in the Ruthless S. at Aqueduct. GENERAL DOWNS has had 8 starts in his 2018 campaign and has been on the board in 7 of them. Today he raced a mile at Laurel and vied 4 wide to score by a neck. The 5-year-old Mineshaft gelding is owned by West Point Thoroughbreds and is trained by Kelly Rubley. He has earned over $150,000. Stay Thirsty ridgling pulled away to win by 3 3/4 lengths. Bred in Kentucky by Michael Edward Connelly, out of the Mineshaft mare Miner’s Secret, LaPenta purchased Coal Front for $575,000 from the consignment of Krikwood Stables to the 2016 Ocala Breeders’ Sale April Sale of 2-Year-Olds in Training. He has won five of his seven starts and earned $477,480. Robert LaPenta and Head of Plains Parners’ Coal Front proved he was back in top form Dec. 22, when he turned in a dominating performance in the $100,000 Mr. Prospector Stakes (G3) at Gulfstream Park. After suffering a condylar fracture to his right front leg in 2017 that required surgery and a layoff of 13 months—the second condylar fracture of his short career—the multiple stakes winner returned to racing in the fall of 2018. The 4-year-old Stay Thirsty colt’s first effort back in the Nov. 2 Bold Ruler Handicap (G3) at Aqueduct Racetrackwas not on par with his prior efforts, and he finished fifth in the six-horse field. Saturday proved to be a much different story. After a sharp break from the far outside post 11, Coal Front rated well on the outside in third behind early leader Kroy, who led the field through a half-mile in :45.31. Four wide with a quarter-mile to go, Coal Front advanced steadily and dueled briefly with Kroy in the upper stretch, where the two made brief contact. Edging past his rival with a final kick, Coal Front straightened out and pulled away to win by 3 3/4 lengths. The final time for the seven furlongs was 1:23.16. Cutting through the pack to find clear trip on the rail, Storm Advisory rallied for second and was followed by Heartwood in third. It was another 1 1/4 lengths back to last-out Claiming Crown Rapid Transit Stakes victor Uno Mas Modelo in fourth. “We’ve targeted this race since then, and he’s trained as well (as) we’d hoped he would have—actually, as well or better than ever—and got the trip we were wanting today,” Pletcher said. “To be honest I’d be really disappointed had he not performed well today based on the way he’s been training. Last spring, consignor Kip Elser and a longtime client came into the Fasig-Tipton Gulfstream Sale with five horses and an old idea made new again. The five 2-year-olds bypassed the typical pre-sale breeze and instead galloped down the lane during the auction’s under-tack preview show. The experiment proved enough of a success that the two men have purchased another group of yearlings this year intent on repeating the scenario at the 2019 Gulfstream sale. In addition to the five yearlings purchased this fall for the original client, who has chosen to remain anonymous, a further four yearlings were purchased by a separate group of partners. Three of the five 2-year-olds purchased as yearlings in 2017 under the name Gulfstream Gallop sold at the 2018 Gulfstream auction, led by a Noble Mission (GB) colt who brought $120,000 and a filly by Blame who sold for $100,000 to Dennis O’Neill. The filly, named Splashy Kisses, was a maiden winner at Del Mar in August and finished second in the GII Pocahontas S. at Churchill Downs. She was eighth in the GI Breeders’ Cup Juvenile Fillies. After putting a toe in the water last year, Elser’s client decided to increase his investment going into the 2018 yearling sales. Gulfstream Gallop opened its 2018 yearling purchases with a $50,000 colt by Bayern (hip 284) at the Fasig-Tipton July sale and purchased a colt by Flatter (hip 1756) for the same price at the Keeneland September Yearling Sale. It made its biggest purchase of the year with a $65,000 daughter of Street Sense (hip 123), one of three purchased at the Fasig-Tipton October sale. While most of the horses purchased in the group were signed for under the name Gulfstream Gallop, one who wasn’t is a colt (hip 229) who RNA’d for $100,000 at the Keeneland September sale. 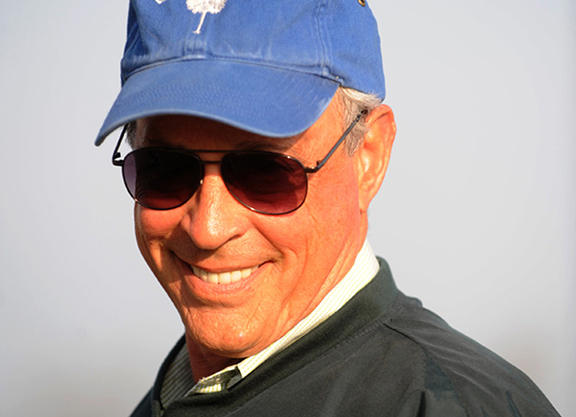 While the Gulfstream sale is still months away, Elser is already feeling positive about the 2019 gallopers. The Gulfstream sale will be held Mar. 27 next year and its date on the calendar makes it a perfect spot to sell these prospects, according to Elser. Elser stressed these horses will be doing exactly what was intended when they gallop in Hallandale next spring. “I think it is important that people know what this group is,” he said. “They haven’t been tried and found wanting. Right from the start this was the plan. As we did last year, they will two-minute lick down the lane at Gulfstream. The intent is to go just fast enough that the guys with the motion analysis cameras can get a read on them. That’s it. Whether you call it an open gallop or a two-minute lick, I don’t know. It is not a fast breeze. Recent winner of the Bob Hope S G3, MUCHO GUSTO led through a quarter in 23.25 and a half in :47.25 in the Los Al Cash Call Futurity. The eventual winner tracked two wide in a joint third under a tight hold from Van Dyke. Mucho Gusto tried his best to stick with his stablemate, winner Improbable but that one hit another gear in mid-stretch and powered clear of the pacesetter. Recent MSW winner and TDN “Rising Star” WINTER STAR (Tapit), racing for the Phillips Racing Partnership, is the second foal out of the 10-year-old WINTER MEMORIES (El Prado), winner of the G1 Diana and Garden City Stakes. WINTER MEMORIES is the best runner produced by MEMORIES OF SILVER (Silver Hawk), winner of the G1 Queen Elizabeth Challenge Cup and Beverly D Stakes. Third dam All My Memories (Little Current) was out of Java Moon (Graustark), one of three stakes winners and four stakes-placed runners produced by “BLUE HEN” Golden Trail (Hasty Road), whom John Galbreath had acquired for Darby Dan Farm in the early 1960s from the dispersal of Brookmeade Stable. Kirkwood is proud to have started Winter Memories and Memories of Silver. Winter Star was also trained in Camden, but by Kirkwood friend Frank Smith.